Check back often or Email to Order or Make Inquiries. Miss Ainslie gathered a bit of rosemary, crushing it between her white fingers. "See," she said, "some of us are like that; it takes a blow to find the sweetness in our souls." Thank you for taking the time to learn more about us and the amazing world of aromatherapy and other natural health alternatives. At Jrily Botanicals, we view our product as a holistic, natural approach to physical and emotional health. Though the sensuous pleasure of scent may be what initially attracts you to such products, it is our hope we can help you discover what truly wonderful gifts nature provided for our health and happiness. Again, thank you for stopping by. Please check back often as we will be adding materials and products daily. We appreciate your patience as we develop our online presence and assure you that we will do our very best to meet your needs. What is a Jrily Botanical Spa Party? To learn more about Aromatherapy and the benefits, please visit AromaWeb for a wealth of in-depth information, articles and resources. We will have our resources uploaded to our new site soon. All our labeled products are handmade in small, quality-controlled batches using the finest, natural ingredients we can find. Our labeled bath, skin care and culinary products contain only 100% essential oils of therapeutic quality - no synthetic fragrances or chemical preservatives. Synthetics may nice, and even cost less, but they provide none of the health benefits unique to the molecular structure of essentials. All our bath salt products contain AI MEI's 100% authentic, certified Dead Sea Salt (Israel), which is collected and packaged at the southernmost area of the Dead Sea, where mineral content is richest. Most ocean water is 3 percent salt. Dead Sea water is 32 percent salt with much higher concentrations of magnesium, calcium, bromide and potassium. 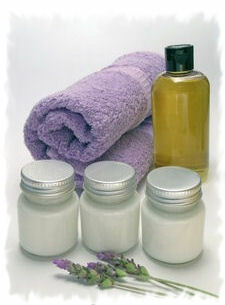 It nourishes skin, eases discomfort, increases circulation and relaxes nerves. Scientific research reports that Dead Sea treatments are effective for conditions like psoriasis, seborrhea, chronic fatigue, rheumatic and respiratory diseases. To add another healthy, luscious layer to your aromatherapy treatment, we began custom blending herbal and floral teas using quality, all-natural ingredients. We are happy to customize a blend especially for you or a loved one. We can package teas as single-serving bags or 'loose' bags for use with a strainer. We also offer a wide range common and hard-to-find dried herbs, spices, flora, roots and seeds. Most items are available whole, powdered or ground, and can be packaged in small- or standard-sized spice bottles (w/shifters) or in various-sized poly bags. If you need don't see something you need or would like to try, just ask, and we'll do our best to find it for you. As you learn more about aromatherapy and experience it's wonders more, you will no doubt be curious about various blends and treatments, which we will be happy to create for you. Our most recent success story involves a diabetic patient suffering from dry, cracked hands. She tried 'everything, so we developed an oil blend especially for her, and within days she began feeling considerable relief. Gift baskets are perfect for nearly any occasion and can be custom made with your choice of product, fragrances, themes and sizes. We will soon have have two new product lines: one tailored for teens and another for men. When I talk a man into trying one of our products, I am no longer amazed at his surprise and interest in the experience. A safe alternative to candles, our new line of Reed Diffusers are guaranteed to provide continued fragrance for months on end. Dried potpourri can also add a continual, subtle perfume to air, as well as scent contents of drawers and closets, add a decorative, natural touch to any room, repel moths and other insects, and add harmony and texture to an atmosphere. As with most of our products, custom blends are available.